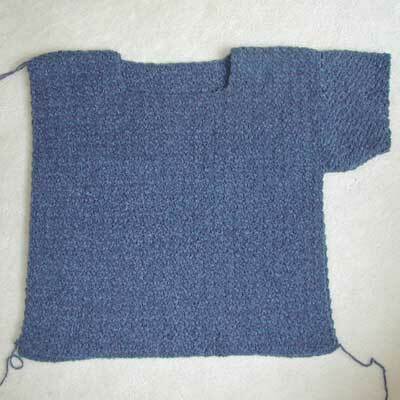 I’ve made progress on the tee top sweater that’s been in my on the back burner section for ages. I started it in March. It’s a simple and could be done quickly, but I’ve mostly worked on it during weekend car rides while my husband is driving. Now I’m struggling with the sleeves. The sleeve in the photo above is made exactly as in the pattern, and it looks terrible. You can see it bulges at the bottom. It bunches up way too much under the arm. Even before I started working on the pattern I knew I wanted to modify the sleeves to make them smaller and less bulky. But it’s turning out to be more difficult than I anticipated because of the stitch pattern. I’m going to keep working on it until I get it; I’ve come this far! P.S. We’re leaving tomorrow (Thursday) morning for a long Memorial Day weekend and won’t be back until Monday afternoon. I hope everyone has a great holiday weekend! *sniff* Hurry back and have fun! The sweater looks lovely, I love that deep blue color. I love the color of the sweater…hope you get the sleeves worked out though.